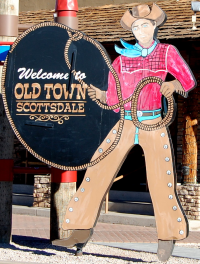 From this page you can easily browse all homes for sale in Old Town from the AZ MLS. Our listings are updated daily, so you can be assured you're viewing the most current and up-to-date information available. 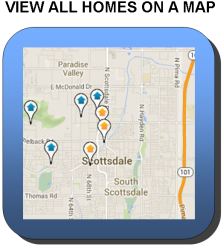 To begin, simply click on one of the buttons below to view a list of all homes, or browse homes by location on a map. Generally those attracted to Old Town Scottsdale aren't necessarily looking for a sprawling estate, with a lot of elbow room and endless mountain views. 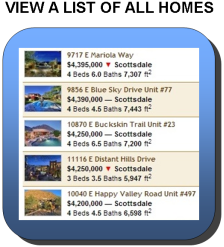 Those buyers typically gravitate towards North Scottsdale where homes of that type are much more common. There are some homes of that nature available in the 85251 zip code. They tend to be in the highly regarded Arcadia area, South of Camelback Mountain. Many Old Town buyers decide to purchase for the countless galleries in the Art District, 85+ lounges in the Entertainment District, trendy restaurants, close proximity to Scottsdale Fashion Square, art shows, museams, and countless special events. Not to mention easy access to Phoenix Sky Harbor Airport, Arizona State University and the 101 + 202 freeways. Old Town is where Scottsdale originated, so the norm is going to be slump block homes built in the 50's and 60's from builders like Hallcraft, Farmer, Allied and Butler. Due to the popularity of the area and increasing values, many have undergone extensive remodels and now feature upgrades such granite counter tops, dual pane windows and stucco exteriors. Home buyers can expect to pay anywhere from approximately $225,000 for a starter home, and up to $8,000,000 for a luxury estate in the area.